If you're chasing perfection, then look away now because you won't find it in Forza Motorsport 5. 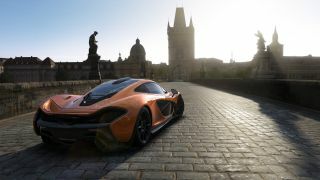 Instead, what its developer Turn 10 is delivering is true authenticity, a mix of the flawless high-end motors you'd expect from an elite racing title and the myriad imperfections that true racers encounter while driving them. Harnessing the next-gen power of the Xbox One, every single deviation on the road surface, groove in your tires and scratch on your brake pads is immaculately modeled, making this one of the most detailed and most importantly real racing games ever conceived. Check out this brand new video to see just how Forza 5 performs out on the track. First and foremost though, the cars are the stars, with a range of high end supercars and bucket list motors presented in a stunning virtual garage that most petrol heads could only ever dream of owning. Imagine taking James Bond's classic Aston Martin DB5 for a spin, powering around a test track in a modern supercar like the 2013 McLaren P1 or negotiating the twisting thrills of a high alpine road in a Lamborghini Aventador. Forza 5 allows you to live out these driving fantasies to the full. Naturally, even the finest driver needs worthy opponents (just ask Sebastian Vettel) and you'll be able to test your mettle against the very best with Forza's innovative new Drivatar system. This records and maps your driving characteristics while you play, creating a virtual persona or Drivatar based on your own unique driving style. Computer controlled opponents will be generated from these Drivatars to provide some of the most intense AI driven racing battles – with your opponents drawn from the ranks of the world's best Forza 5 competitors who will continue to evolve over time to provide you with the ultimate driving challenge. Just like the giants of F1, Indycar and Le Mans, Forza 5 Motorsport's advanced next-gen features mean every race in Forza 5 will truly tell its own unique story and we can't wait for the five lights to go out and the chequered flag to come down. Forza Motorsport 5, out now only on Xbox One.